Tai chi sword is known as the "king of the short range weapons" for Tai chi. At an overall length of about 3 feet, The double edged sword is a good tool to use to judge overall Tai chi proficiency of the player, as any mistakes in the tai chi movements are made visible in the tip of the blade. The sword is a natural amplifier, which consistently and impartially reflects the mistakes of its user. If the swordsman’s grip and cut are incorrect, his sword may wobble, or even ring. When the position of his wrist is wrong by one inch, the tip of the blade may be wrong by one foot. If his body movement is slightly incorrect, a good sword helps to make that obvious; with a tassel, even more so. Traditionally, the Tai chi sword was crafted to fit the size of the user, and then balanced to his or her needs. Today, many of the swords are mass produced with varying weight and balance. So how to modify your sword, to make a custom sword has to be learnt. Also care and maintenance for the double edged sword should be a priority. "All weapons Tai chi broad sword, tai chi double edged sword, staff etc should be cared for and respected by all uses." A wooden sword or dull blade is best for a start for learning this fine art as it minimizes risk of accidental cut of oneself or other class mates. Teaching of sword in tai chi is usually but not always done at the time the student is deemed ready to learn by his/her teacher, this can be up to 3 or even more years, as a good grasp of the key principle of the Tai chi movements is required. The tip and top 3 inches of the weapon is the business end and is kept razor sharp, as it is use not like most swords. By that I mean it is not used to hack an opponent but instead to cut vital organs ligaments and arteries. Most of the tai chi sword movements are designed to nick these vital parts of the body rather than to take of limbs. The sword can helps prevent small errors from escaping its user’s attention, and thereby train the hand that holds it, and the mind which directs it. The sword as stated before is around 3 feet long with a double edge blade ranging from 28 to 30 inches long and is 1-1/2 to 2 inches wide. The handle potion is around 9 inches. The top 1/3rd or more of the blade and the tip are sharpened. In the end of the hilt there is a hole which is used to attach a sword knot or tassel which is usually red and works as a sort of distraction of sorts to your opponent. The straight sword is a beautiful ancient weapon first mentioned in China's oldest written records. It is the weapon most associated with Tai Chi and with Taoism in general. The Sword has been used in China for the last 2500 years, gradually evolving from crudely constructed bronze swords to the more sophisticated steel ones of today. There are two types of straight sword. A bigger heavier sword called the martial sword (Wu Jian) or male sword (Xiong Jian) and had a sharp tip. 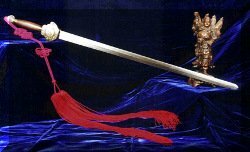 The lighter shorter sword called the scholar sword (Wen Jian) or female sword (Ci Jian) had a slightly rounded tip. The martial sword was designed to be taken into battle but was not as practical in peace time, so the scholar sword was used instead as an everyday defense weapon. The correct sword balance directly refers to the fulcrum of the sword. For a quick-moving, with a lot of wrist movement sword play (such as in the tai chi Straight Sword), you want the balance point to be right where you grasp your sword or just in front of it. This will normally be within 1/2" behind the guard, right at the guard, or about 1" in front of the guard. This will depend on whether you will be using a tassel to practice or not, and how much wrist mobility you will want. The more the balance is in your grip, the stronger you have to be to hold the blade if the sword is struck by your opponent. A forward balance point will allow you to use the inertia of the blade to your advantage. For the Broadsword, you want the balance brought forward because the weapon is meant to be used for hard swings where the weight of the blade will do most of the work. Normally this will reside somewhere between 4" and 8" in front of the guard. Tai Chi Broadsword ( dao) is another one of the weapons in the Tai Chi Chuan system. It is heavier than the straight sword and it normal taught before the tai chi straight sword. The Broad sword has one sharp edge rather than the doubled sided straight sword. This weapon un like the straight sword is designed to hack though limbs. offensive and defensive moves are combined with the tai chi broad sword. Which means that within each movement, there are both offensive and defensive moves. The back of the broadsword, is used it to block and to get closer to the opponent. There are 13 techniques to the Tai chi broadsword (upper cut, under cut, cross cut, chop, split, lift, stab, block, pull coiling, push, intercept and parry). Understanding the application in each movement is essential so as to properly execute the movements. "To practice the Tai Chi Sword correctly, the first thing a practitioner must be able to do is to have a flexible body and wrist so that the sword and the body will coordinate and move in unity. The second thing is that the intent should direct each movement so that all the movements have applications, speed and accuracy. The third thing is to have spirit and natural breathing in each movement. In usage, it also emphasizes the concepts of sticking and adhering, running and following. In summary, in order to practice the Tai Chi Sword correctly, a practitioner must execute all the movements in an even, soft, continuous and smooth manner. All the movements are initiated by the waist, controlled by the wrist, with the upper and lower parts of the body coordinated so that when one part of the body moves, all parts follow. When one part stops, all stop. Therefore, all the movements are very light, speedy, flexible, nimble and stable. People often describe these kinds of motions as like a "swimming dragon and flying phoenix." Tai chi sword maintenance and care is all part of learning the tai chi sword, for more info on tai chi sword care, use this link. Tai chi sword movements are improved by customizing and modifying your sword so it fit you just right is also an important task to learn. Do you have a question about the sword we could help you with? Can you share some tips about The sword you have picked up on your journey? Have you brought a Tai Chi sword that you would like to share your comments, or show a photo of ? You can have your say and your own page on the Tao Of Tai Chi web site. If you would like to enter a url to another site you will have to add it like this (w.yoursite.com) I will then enter it manually after submission is made. Want to keep up to date as new pages are added to this site? click on the RSS feed on the left under the navigation bar. The Tao Of Tai Chi Blog keeps you up-to-date with all additions and changes to the Tao Of Tai Chi web site. Subscribe here. Tai chi movements or forms activates and flows energy through the body. Tai Chi Chuan styles are many and varied, as are the tai chi forms, still they all follow the basic principles of the tai chi movements. Tai chi Chen style was the first of the Tai Chi Chuan styles. It was created, as the Ming Dynasty was about to become the Qing Dynasty in 17th century China. tai chi Yang style has a moderate and easy flowing method of the makes it easily learned by the majority of people and this is why it has such a great following and has become the most popular of all the tai chi styles. Wu Tai chi, which is also known as Hao style, Taijiquan (Tai Chi Chuan) has a set of strict requirements regarding its practice. From the external to the internal, each requirement is clearly stated. Sun style tai chi is characterized by lively steps- forward or backward steps are always followed by the other foot. The function of silk reeling energy is to unify the body and connect the energy throughout the body with the datian so that it can reinforce movements of all parts of the body. Tai Chi symbol relates to the flow of the opposite energy that makes up the law of the universe. Tai chi benefits have been studied in more depth over the past 30 or so years, by western medicine which is of course prescribing tai chi now as a low impact exercise. Tai chi exercise reduces stress. How to balance a sword or, a tai chi sword in particular is not as tricky as you may think. Sword sharpness comes after sword balance and integrity in the order of the sword, how to. Tai chi how to is a page that answers some of those how to questions that pop up to do with tai chi. Please if you have a how to question that you would like answered use our contact us page and we will try to answer it for you. Here are a few great health links we have found for you on the internet. You never know when some of these great health links might come in handy. We will be adding to these links all the time so, come back to check this page out often. Tai Chi World News, The best up to the minute breaking world tai chi news and headlines. You can even leave a comment and your opinion.